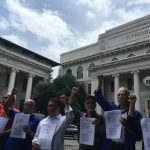 MANILA, Philippines (UPDATED) – Martial Law victims on Monday, August 15, asked the Supreme Court to intervene and stop the planned hero’s interment for the late dictator Ferdinand Marcos. 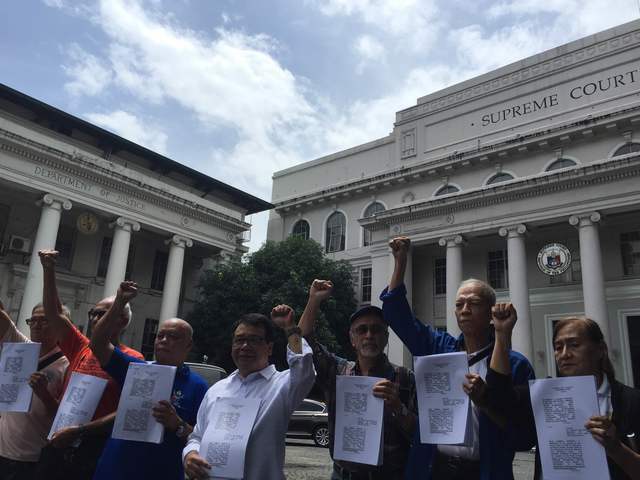 Led by former Bayan Muna Representative Neri Colmenares and activist Bonifacio Ilagan, the petitioners argued that the late president does not deserve a slot in the national shrine because burying him there violates Republic Act 289, which created the Libingan ng mga Bayani. “The law states that only Presidents worthy of emulation and inspiration deserve to be buried there,” Colmenares told reporters in Filipino. “Marcos is a dictator and should not be emulated or be a source of inspiration,” he added. Colmenares also stressed that the Armed Forces of the Philippines (AFP) guidelines disqualify soldiers guilty of moral turpitude from being buried there. He recalled the massive human rights violations committed during the Marcos regime. Ilagan said the petition also cited the law recognizing and providing reparations for Martial Law victims. The petition was filed a day after President Rodrigo Duterte stood firm on his decision to bury the late strongman at the Libingan ng mga Bayani (Heroes’ Cemetery). “There is clarity in the regulations governing the late President Marcos burial. The President shall therefore remain undistracted,” Communications Secretary Martin Andanar said in a statement on Sunday, August 14. Thousands of protesters also staged a rally on Sunday despite the bad weather to urge Duterte to stop the planned burial for Marcos at the Libingan. Prior to the rally, allies of both former president Benigno Aquino III and Duterte declared their opposition to Marcos’ burial at the Libingan ng mga Bayani. Defeated LP presidential candidate Manuel Roxas II and senators Leila de Lima, Francis Pangilinan, Paolo Benigno Aquino IV, and Risa Hontiveros were among those who attended the protest at the Rizal Park. Senators Aquilino Pimentel III and Alan Peter Cayetano – Duterte’s key allies – are also against his decision. The military has started its preparations for the burial set in September – Marcos’ birth month.